World Trade Organization (WTO) Director-General Roberto Azevêdo announcing the WTO's trade growth projections at a press conference in Geneva. While forecasting that growth in the volume of global merchandise trade is expected to rebound this year from its weak performance in 2016, the World Trade Organization (WTO) today cautioned that “deep uncertainty” about near-term economic and policy developments in some countries raise the risk that trade activity could be stifled. The WTO, which often cooperates with the United Nations on trade matters, forecast that global trade will expand by 2.4 per cent in 2017, but only if the global economy recovers as expected and governments pursue the right policy mix. Owing to this uncertainty, this figure is placed within a range of 1.8 per cent to 3.6 per cent. In 2018, the WTO is forecasting trade growth between 2.1 per cent and four per cent. The unpredictable direction of the global economy in the near term and the lack of clarity about government action on monetary, fiscal and trade policies raises the risk that trade activity will be stifled. A spike in inflation leading to higher interest rates, tighter fiscal policies and the imposition of measures to curtail trade could all undermine higher trade growth over the next two years, said the WTO. "Weak international trade growth in the last few years largely reflects continuing weakness in the global economy,” said WTO Director-General Roberto Azevêdo on the launch of the organization’s 2017-2018 forecasts, adding that trade has the potential to strengthen global growth if the movement of goods and supply of services across borders remains largely unfettered. However, if policymakers attempt to address job losses at home with severe restrictions on imports, trade cannot help boost growth and may even constitute a drag on the recovery, he continued. Mr. Azevêdo said that the fact is that the economy is changing fast – driven by technology and innovation. Eight in 10 manufacturing jobs are lost to innovative technologies and higher productivity. It is estimated that 65 per cent of children entering primary school today will end up working in types of jobs that don’t yet exist. “We have to adapt to this new reality. That means applying the right mix of policies across a range of areas. At the domestic level, policies are needed to help support the workers of today and train the workers of tomorrow,” he said, underscoring: Closing the borders to trade would only worsen the situation – it would not bring the jobs back, it would make more jobs disappear.” He called for measures to keep using trade to deliver more benefits to more people. 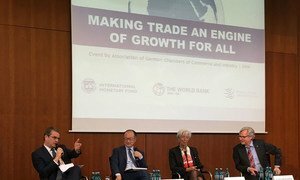 More trade integration can help make the system more inclusive – connecting new industries and smaller players to new markets. Trade and trade-related policies have a role to play not just in promoting growth and prosperity, but helping share that prosperity more widely, United Nations global finance partners said today, launching a report that calls on national governments to pursue policies that help those who might lose their jobs, one of the unintended consequences of trade integration.